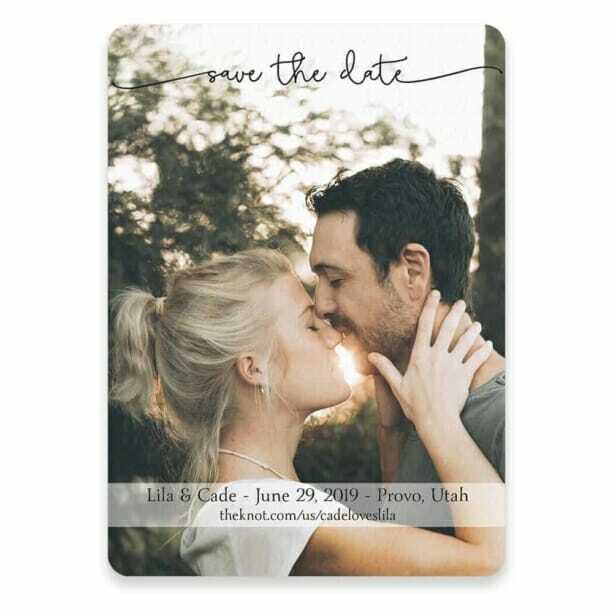 Save the Date Postcards are printed on heavy-weight card stock and can be mailed without an envelope. Color, font, wording and layout may be customized. This card is printed on beautiful, textured card stock in your choice of white or ivory. Pearl luster card stock is available for a small fee. Can I change the wording/layout? Yes, you can adjust the wording and layout. Simply type your special instructions in the order form and our design team will update your proof. What color envelopes will come with my invitations/cards? Your envelopes will match the card stock color you choose during the order process. White and ivory card stock are available (with matching envelopes) or you may upgrade to pearl luster card stock, which comes with a pearl luster envelope. Color envelopes are available in a variety of shades for a small fee. Envelope liners are an available upgrade and will be installed in the envelope color you have selected. View envelope color and liner color options. Will I get to see it before it’s printed? Yes, after placing your order, you will have the option to request a full-color e-mail proof within 2 business days. If you need changes, simply reply to your proof and we’ll update your design. Your order won’t be printed it until you are 100% satisfied with the design. Not a problem. We’ll update your proof as many times as necessary, for free, to get it right. If you still don’t like your proof, you can cancel your order and get a full refund. Can I change a design? Yes, you can change the font, wording, layout, and colors. You’ll simply need to write your request in the special instructions box on the order form. How does guest address printing work? If you’d like your guest’s names printed on the envelopes, simply choose “guest address printing” during the order process and download the guest address printing template. Complete the template using a spreadsheet program such as Microsoft Excel or Google Docs and e-mail us the file. Our design team will format the addresses so they match your wedding invitations and we’ll e-mail you a proof to review. Do you have programs, thank you cards or place cards that will match this invitation? Matching programs, thank you notes, and place cards are available. They will be designed to perfectly coordinate with your wedding invitations. To order, simply purchase an item from the links below and we’ll start working on your design immediately. You’ll receive an e-mail proof within 2 business days and your order will not be printed until you have given us permission to print. Invitations and save the date cards are printed within 3 business days of receiving your design approval or proof approval. Your order will then be shipped via the method selected during checkout. Yes, we offer a free sample kit so you can see a variety of printed products and inspect their quality. Click here to order a sample kit. Specific design samples are not available. However, you may purchase a single (quantity of 1) card or invitation and have it printed with your information. If you are unhappy with the item you may return it for a full refund. Yes, you can make changes to your order as long as you make them before you have approved your proof to print. After your order has been released to production, we aren’t able to make further changes. You may purchase a single (quantity 1) card or invitation that has been personalized with your information. If you received the item and are unhappy with it for any reason, you may return it for a full refund. Refunds are not provided on order quantities larger than 1. Please ensure you have enough time to receive a sample before placing a larger order. Non-personalized items are returnable, but you must pay the shipping cost to mail it back. A sample kit containing an invitation, save the date card, magnet, color chart, and font guide is available. Samples of specific designs cannot be accommodated but the kit will contain a variety of products so you can see view paper and print quality. Customized samples are available by purchasing a quantity of one (1).